6 Screens-What Are They? A Message For JW's Witness to a Witness Calls to the Watchtower Pedophilia DISFELLOWSHIPPED! A CULT? Perhaps the most disturbing aspect of the Watchtower world is the deliberate tolerance of sexual predators within "Jehovah's Organization". Despite their denial, Jehovah's Witnesses are trapped in an organization which tolerates disgusting and deplorable behavior. 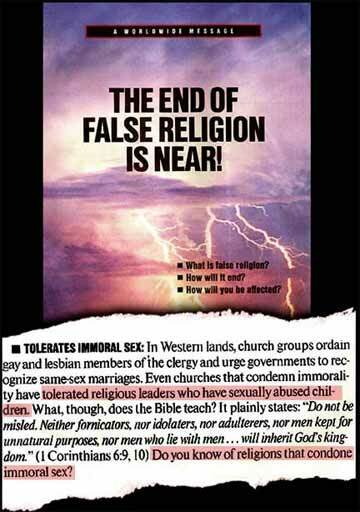 Watchtower publication. Kingdom News #37. For more disturbing information see "Raped at Bethel"
Cochise Pendleton is a Christian and former Jehovah’s Witness. "The Bible vs. The Watchtower"
a #1 BESTSELLER on Amazon.com. Also, check out Cochise's Conference Call- Christianity 101. "Boots on the Ground Protest 2017"
The "BOOTS ON THE GROUND" protest against the Watchtower Organization have been taking place since 2004 and these Demonstrations will continue in the months to come. What does the Watchtower have to say? Many former Jehovah's Witnesses have combined their talents and abilities hosting Six Screens talk show programs to help all of those that have been "touched by the tentacles of the Watchtower Organization"
7 PM. EST.Every other Saturday "The Six Screens of the Watchtower Conference Call". This program is the hub for all the scandals and cover-ups going on behind the curtains of The Watchtower. a former Jehovah's Witness and author of the book "The Bible vs. The Watchtower" Listen in the archives to his informative Biblical discussions. 1 AM EST. Every Saturday Late Night with the Twins This program is light and playful, so if you can't sleep and wake up in the middle of the night and don't know what to do.... talk with the "wild, wild west twins"
Saturdays @ 6:30 PM EST. & Everyother Sunday @ 2:00 PM EST. Jehovah's Witness World News bringing you the latest critical information about what is going on in the "World of the Watchtower". "We report the news and our callers get to spin it"
9 PM EST. Every Saturday Watchtower Conspiracies and Mind Control The Watchtower Society is an esoteric Organization, and are doing everything in their power to hide their secrets. Host Dianne dares to go where others will not go. The evil , cruel punishment of SHUNNING takes place when a person is disfellowshipped in the Jehovah's Witness Religion. Listen in the archives to people speaking up about this horrible practice. 4:00 PM EST. Every other Sunday Hens Pen "Where the Chicks Chat" You do not have to be a chick to chat, everyone is invited into this lively, friendly program. Wendy and Marilyn as followers of Christ and have no problem exposing the counterfeit dogma that is taught in The Watchtower Organization. 2:45 PM EST. Every other Sunday Upper Room Ministries Listen in as former Jehovah's Witnesses and fellow Christians meet in a house church in New England. Experience interactive Christianity, the way they did it in the first century.